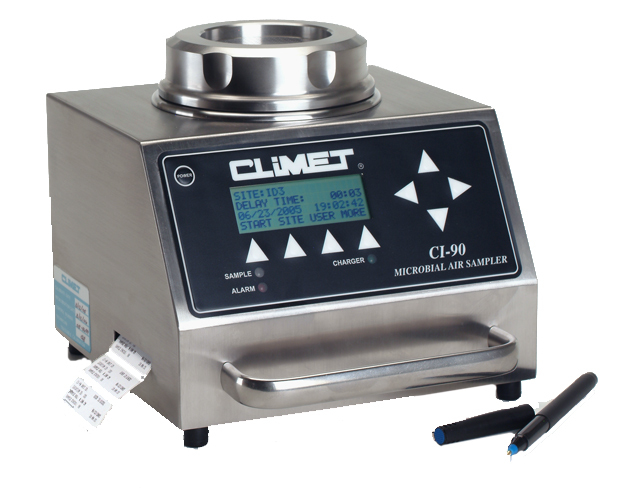 The CI-90/CI-90+ Microbial Air Sampler has a 100 l/min flow rate, internal label printer and is designed to use industry standard 90 mm petri dish. Designed for low particle emissions, the viable air sampler features a filtered exhaust and certification. Battery provides 7 hours continuous sampling. The CI-90/CI-90+ Microbial Air Sampler has a 100 l/min flow rate, and is designed to use industry standard 90 mm petri dish. Designed for low particle emissions, the viable air sampler features a filtered exhaust and certification. Battery provides 7 hours continuous sampling.